Mort Kunstler Handsigned and Numbered Limited Edition Print:"Last Tribute of Respect"
Size: 17" x 29" (Overall size: 22" x 33") - Select Additional Canvas Sizes from Drop Down Box Above. Edition: Artist Signed and Numbered, Limited Edition to 350 on paper with 50 AP's. Medium: Fine Art Print on Paper and Giclee on Canvas editions. About the Art: After being accidentally wounded by friendly fire during the Battle of Chancellorsville, Confederate General Thomas J. Jackson struggled for eight days after an amputation, before finally succumbing to pneumonia on May 10, 1863. In the days following his passing, newspapers printed tributes to the man that many considered a national treasure. The Richmond Times Dispatch published an especially warm homage that summed up the grief of the Confederate faithful. It stated, "Words have no power to express the emotion, which the death of Jackson has aroused in the public mind." The general's body was first placed at the Governor's Mansion in Richmond for the public to mourn, and then it was transported for burial near his home in Lexington. Upon arrival the casket was received by a corps of cadets, escorted to the Virginia Military Institute, and placed in the very same lecture room where, as a Professor, Jackson had taught prior to the war. Major General F.H. Smith, the superintendent at VMI, issued a declaration to his students that stated, "Surely the Virginia Military Institute has a precious inheritance in the memory of General Jackson. His work is finished. God gave him to us, and to his country. He fitted him for his work, and when his work was done He called him to Himself." The stately funeral procession that followed was a testament to the service and sacrifice of the man they called "Stonewall." In accordance with military tradition, his casket was draped with a Confederate flag, placed on a caisson adorned by six mourning plumes, and drawn by four horses. An honor guard comprised of V.M.I. cadets acted as escorts. Jackson's personal staff, including Major A.S. Pendleton, Dr. Hunter Holmes McGuire and Captains Morrison and Smith accompanied his grieving widow, Mary Anna. Virginia governor John Letcher and a delegation of citizens from Lynchburg were also in attendance. Hundreds of mourners lined the road to pay their final respects to a man who had obscurely left for service in the defense of his state, and returned in death as one of the most admired commanders in the history of warfare. Following a service at the Lexington Presbyterian Church where Jackson had been a deacon, his body was then laid to rest in what is known today as the Stonewall Jackson Memorial Cemetery. In the previous painting, "Road to Glory," I showed Jackson leaving the Virginia Military Institute at the head of the Cadet Corps at the beginning of the war. 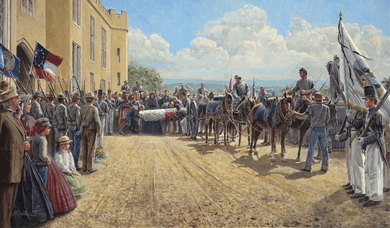 In this piece "Last Tribute of Respect," I once again show him leaving VMI for the last time�in his coffin. Capturing the very beginning of Jackson's funeral procession was a unique concept, but there was more on my mind. I also wanted the painting to serve as a prequel to "Final Visit," with Robert E. Lee at Jackson's grave in Lexington. On Thursday, May 14th, Jackson lay in state in his old classroom. The following morning, the 15th, the casket was loaded onto a caisson and escorted to services in the Presbyterian Church in Lexington. I chose the moment on Friday morning, May 15th, when the casket was brought out through the Washington Arch and loaded onto the caisson. It was a day of somber pageantry; the day of the funeral and burial. The center of interest in the painting is the casket. To achieve the pageantry of the scene, I felt it necessary to pull back my viewpoint, thus making the coffin smaller. By using age old artistic devices, (darkest dark against lightest light), I made the eye go where I wanted it to go. I also incorporated the use of perspective lines, including the wagon wheel tracks, which lead straight to the center of interest. The brightest colors in the painting also add to the one goal of telling the story. The group on the left is a cross section of the civilians who came to Lexington for the ceremonies that day: women, children, and old men. The flags also tell a story by themselves. We see the Virginia flag and the first National Flag on the left. The coffin is covered with the second National Flag, reported to be the very first one to be put into use. The VMI flag with its color guard is on the right, as well as Confederate Battle Flags in the background. The procession that followed the caisson was made up of the Stonewall Brigade, wounded warriors, dozens of honorary pallbearers, the entire Cadet Corps, officials from every level of government, thousands of civilians, men women and children, Confederate officers, family and friends. I am once again indebted to my dear friend, Dr. James I. Robertson, Jr. for his help in setting the scene. This painting could not have been done with the accuracy it has, without the usual unflagging energy and cooperation of Colonel Keith Gibson of VMI.